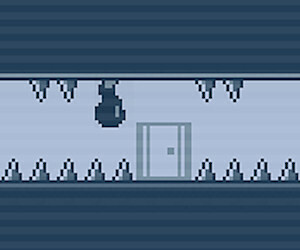 Description An addicting puzzle platformer in pixel style. Complete all 30 challenging levels by jumping, flipping gravity and avoiding obstacles. Change gravity by pressing the space or S button. That way you can walk on the ceiling to avoid the spikes. Set a new fastest time in each level. It will become more difficult each level, can you complete them all with the least amount of tries? Controls Arrow keys or WASD keys. Space, S or Down to flip gravity.